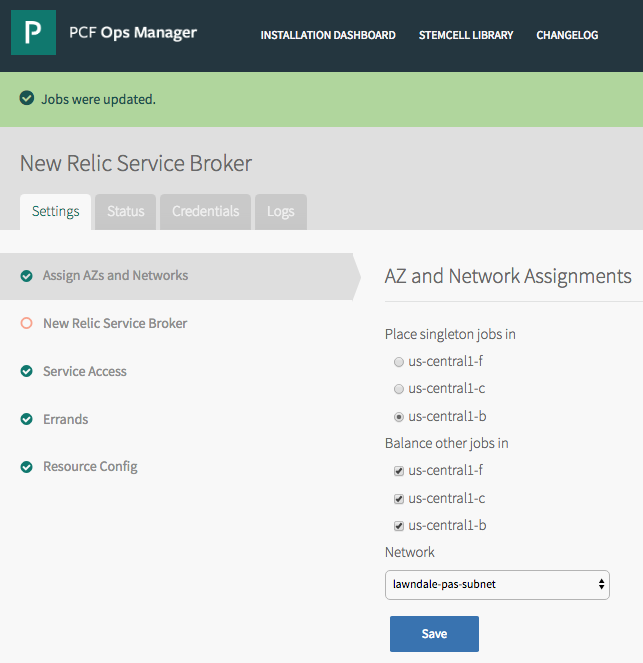 This is documentation for the New Relic Service Broker for Pivotal Cloud Foundry (PCF) tile. 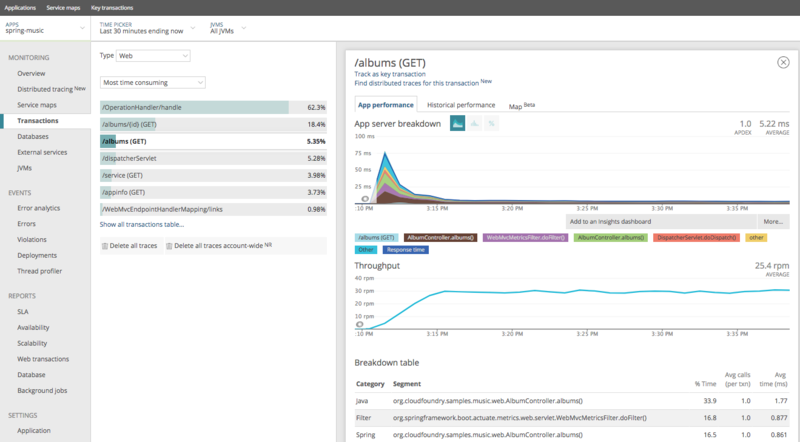 New Relic APM supports real-time instrumentation and monitoring of application performance via its embedded agent that runs with apps. 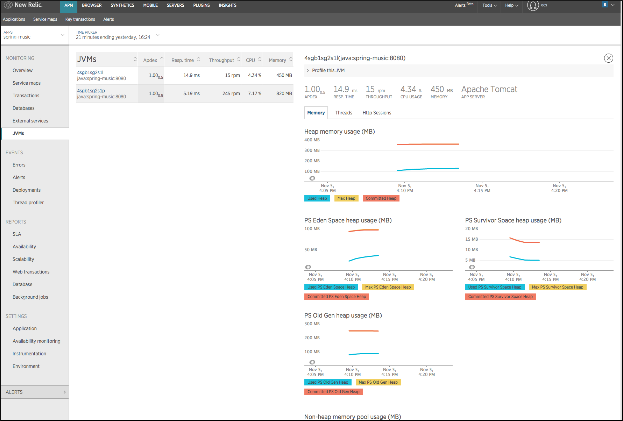 New Relic agent code publishes performance monitoring metrics and other details back to New Relic APM Dashboard. 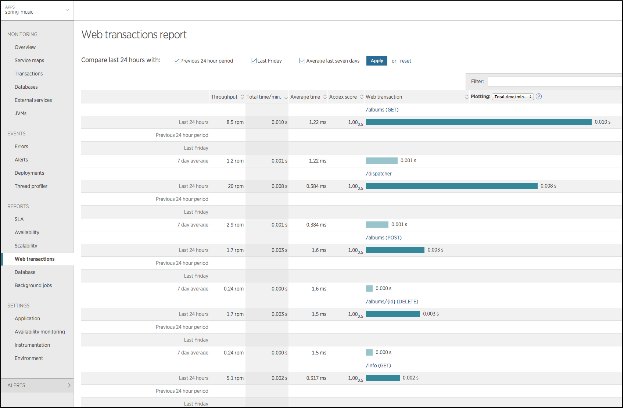 The language agents also send all of the application and browser events to New Relic Analytics tool, Insights, for visualization and dashboarding. A service broker allows Cloud Foundry apps to bind to services and consume the services easily from Pivotal Apps Manager or from the command line. 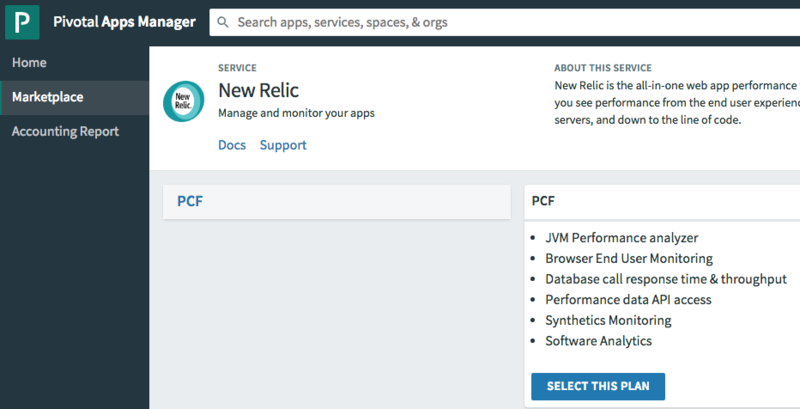 New Relic Service Broker for PCF enables you to use one or more New Relic accounts and is deployed as a Java app on PCF. The broker exposes the New Relic service on the Marketplace and allows users to directly create a service instance and bind it to their apps either from Apps Manager or from the command line. 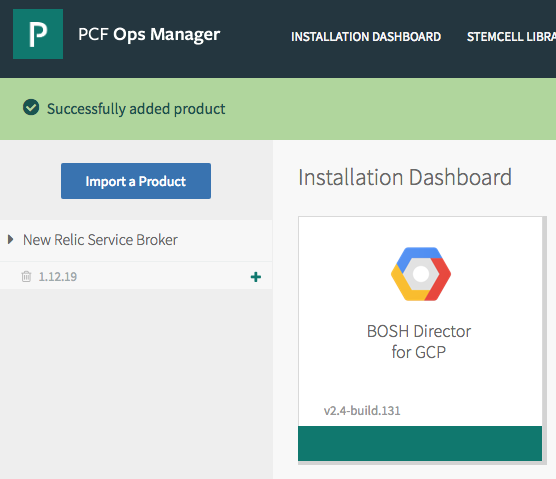 The New Relic Service Broker for PCF tile installs the New Relic Service Broker as an app, registers it as a service broker on PCF, and exposes its service plans on the Marketplace. 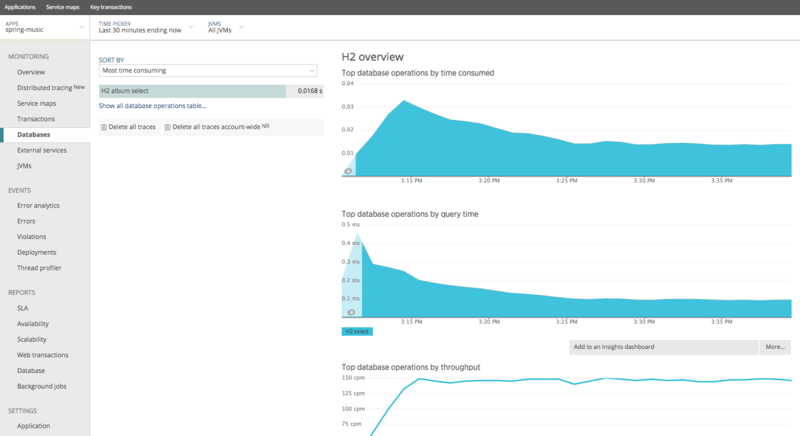 Each service plan is associated with an existing New Relic account, which is configured during the tile setup. 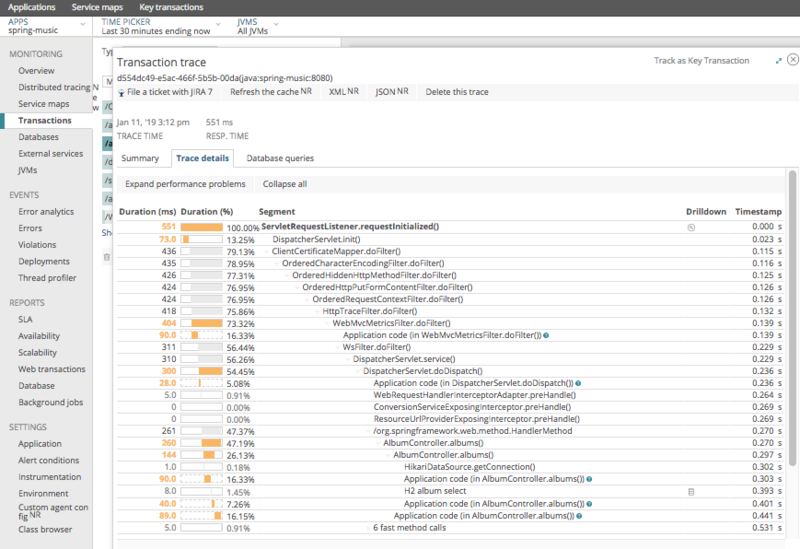 Selecting a plan binds your app with the New Relic agent, and the agent starts reporting to the New Relic account which is associated with the selected plan. 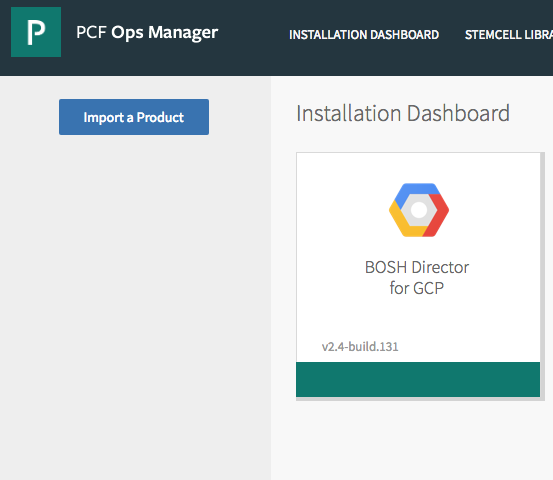 This makes the installation and subsequent use of New Relic on your PCF apps easier and more straightforward. WARNING: The current tile removes the all_open security group from the tile default security settings. If you are using a previous versions of the tile, make your PCF environment more secure by removing the all_open security group from the Application Security Group (ASG) settings. The new version of the tile does not open the security, nor does it close the security if it was already open. The following table provides version and version-support information about New Relic Service Broker for PCF. WARNING: New Relic Service Broker for PCF v1.12.18 and earlier require a Ubuntu Trusty stemcell. The end-of-life date for Ubuntu Trusty is April 2019. If a security vulnerability is found on this stemcell after April, it will not be fixed. New Relic Service Broker v1.12.18 and later allows users to change the New Relic license key in existing service plans. 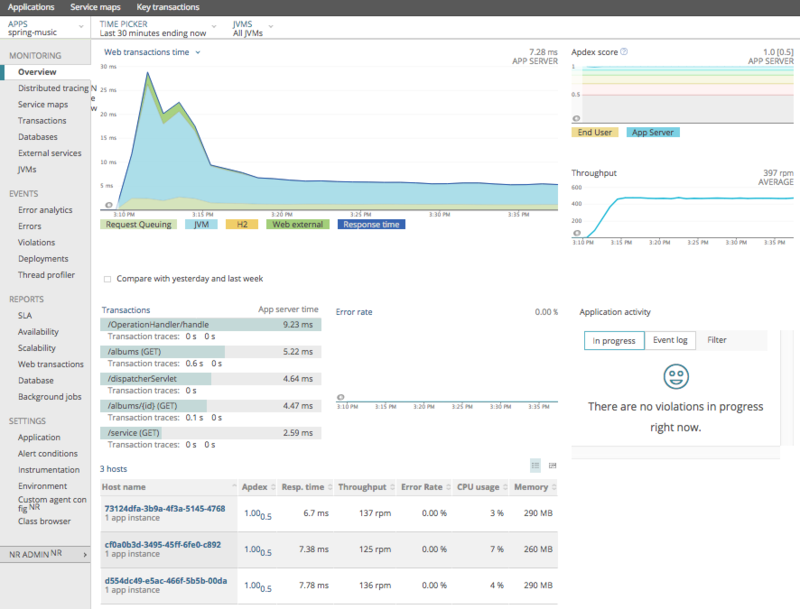 In New Relic Service Broker v1.12.12 and earlier, the unique GUIDs for plans were calculated differently. For these plans to not break compatibility, the GUIDs must be the same as before. The migration script preserves the plan GUIDs for existing plans in the plan collection for v1.12.12 and earlier. There are two new properties labeled pre-1.12.12 plan? and Plan Guid Override (broker 1.12.12 or older) in the plan collection for each plan in the tile configuration. Do not change either of these properties because they are set internally where required. In New Relic Service Broker v1.12.13 and later, leave pre-1.12.12 plan unchecked, and Plan Guid Override blank. The tile is supported on Ops Manager v2.1.x, v2.2.x, v2.3.x, and v2.4.x. You can install the tile on any of these versions, and upgrade from v1.9.x to any Ops Manager version up to and including v2.4.x. No upgrade paths are required for older versions of the tile, since versions older than v1.9.0 are not supported. v1.12.6 and later of the tile support migration from older versions of the tile, and preserve existing services and service plans. If you are using tiles older than v1.11.4, you must first upgrade to v1.11.4, then to v1.12.9, then to the latest version of the tile. 1. 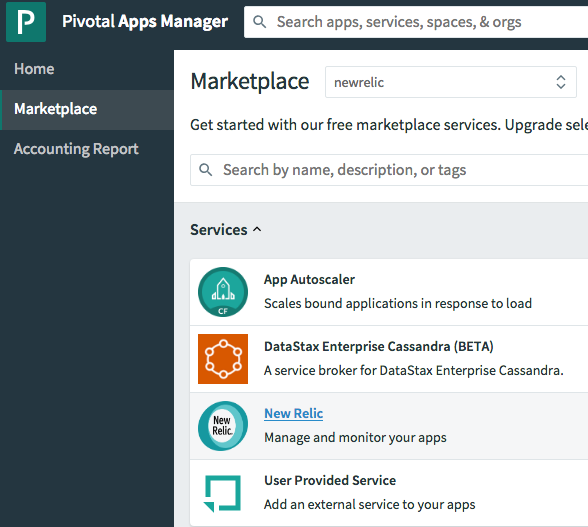 Download the product file from Pivotal Network. Import the product file to your Ops Manager installation. Click the + sign or Add next to the uploaded product description in the Ops Manager left navigation view to add this product to your staging area. Click the newly added tile and review any configurable options. Click Import a Product and import the New Relic Service Broker for PCF tile. Select the New Relic tile. Configure Availability Zone and Network. Configure Service Broker Global Access. You can either keep the global access enabled for all service plans (default), or you can disable global access, and later in the configuration enable access for one or more “orgs” for each “service plan” that you add. 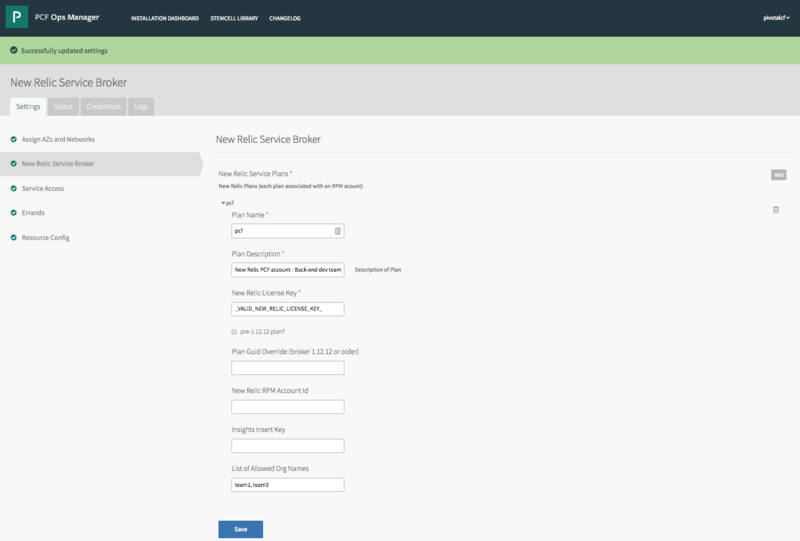 Configure the New Relic Service Broker. Click Add on the far right of the Service Plan screen to create a new service plan. 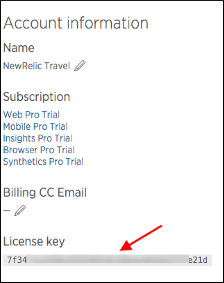 Create a service plan with your New Relic license key. Bind the New Relic Service to an app. 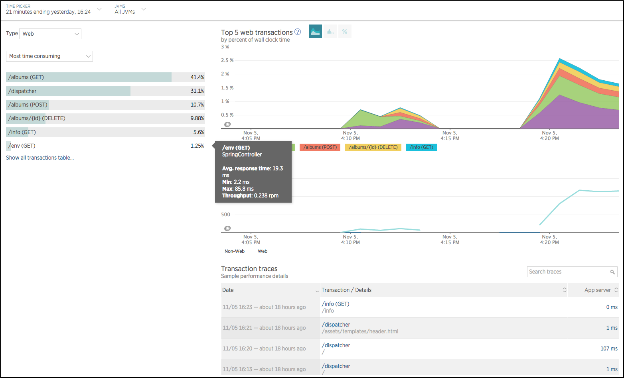 Log in to New Relic to view monitoring data. If the PCF environment needs to use an HTTP or HTTPS proxy for external outbound communication, the service broker itself does not need to know anything about the HTTP proxy, as it relays the license keys to the consumer apps. The consumer app should specify the http\_proxy or https\_proxy as an environment variable for the agent to communicate externally with non-Java apps, and use JAVA_OPTS for Java apps. In addition, the New Relic Agent should also be configured with its own set of parameters (-Dnewrelic.config.\*) to communicate with its controller through the proxy for Java language apps. Whenever making changes to Cloud Foundry environment variables, you must restage your app(s) to make the changes effective. These environment variables can either be set individually per app, or with environment variable groups to be set for all apps as part of staging, running environments, etcetera using the Cloud Foundry Command Line Interface (cf CLI) tool. Use the JAVA\_OPTS environment variable to specify New Relic Agent-specific environment variables in the staging environment group so the Java buildpack can use that and push it in the correct place. Specifying JAVA\_OPTS in the Runtime environment variable group will not yield anything, as the buildpack will not know about it. For more information, see Configuration settings precedence. If you are running PCF in an offline manner, you should recreate and package the dependencies, including the New Relic agent binaries, using offline buildpacks in your PCF environment. For more information, see Packaging Dependencies for Offline Buildpacks. Currently supported buildpacks bundling New Relic Agent are the Java, node.js, PHP, and .NET Core buildpacks. .NET Core requires that you push your app using cf v3-push and specify New Relic’s supply buildpack with -b option in the command line as the first buildpack in sequence. Please provide any bugs, feature requests, or questions to the PCF feedback list.